Two women leaders and recent Mary’s Pence Grants recipients, know the “how” and are working to inspire women to be there for one another as they become leaders in their communities. Fartun Weli is the founder and executive director of Isuroon, an organization that champions health promotion and civic engagement for the Somali women and their communities in the Twin Cities of Minneapolis and St. Paul, Minnesota. 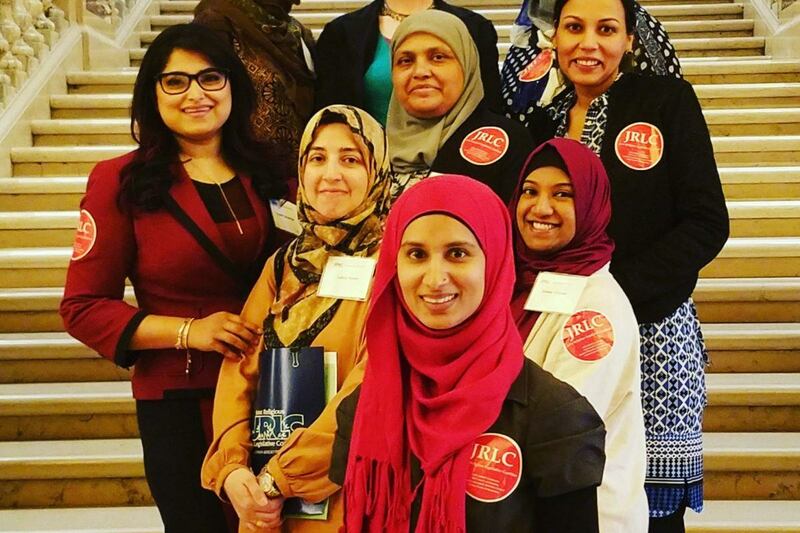 Nausheena Hussain is the leader of Reviving the Islamic Sisterhood for Empowerment (RISE), a leadership resource that creates a safe space for Minnesotan Muslim women. 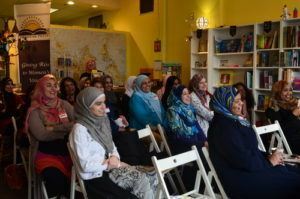 As stand-alone organizers and as part of a network of Muslim women, they cultivate women’s equity from the bottom up. Muna Mohamed, Fartun Weli and Waris Mohamed of Isuroon. Fartun works with the Somali community on the ground, listening to the needs of those who come to Isuroon. “We are like an ER, a walk-in for the community,” she says. The organization juggles four primary facets of work – research, culturally competent health promotion, system literacy and civic engagement, and advocacy. Twice a month, Isuroon runs a food shelf for up to 300 visitors, with donations from Second Harvest Heartland, University of Minnesota and Seward Co-op. The food shelf offers nourishment to underserved Somalians and gives them a space to connect. From her conversations with Somali women at Isuroon public events, Fartun observes: “Cultural loneliness is often part of the Somali Minnesotan experience. People feel isolated, challenged by communication barriers, faced with negative stereotypes against Muslims that appear in the media. Somali women feel a particular loneliness within this loneliness.” According to Fartun, Somali women want to express themselves within the Islamic tradition and follow the Somali cultural norms on reproductive practices or wearing a hijab, yet they often feel judged by non-Muslims. In addition, Somali history and internal conflicts have created political divisions within the community. To find a way forward, Fartun uses the power of listening. The Isuroon office has an open door policy – anyone can come in and join the conversation. “Our community is resilient,” Fartun says. The Mary’s Pence Grant is helping Isuroon focus on sustainable engagement of Somali women in local and national political processes. Isuroon held caucus trainings and helped teenagers understand the voting process so that they are able to fully participate when they turn 18. Isuroon is a space where women gather and share their stories, ultimately recognizing that they are not alone. 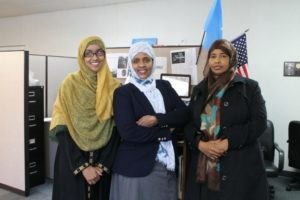 Fartun hopes to make participation in politics part of the everyday Somali Minnesotan culture. She believes that it’s important to encourage women to articulate their needs and communicate them through advocacy. More importantly, she shows them how to use their skills and talent to shape their communities. 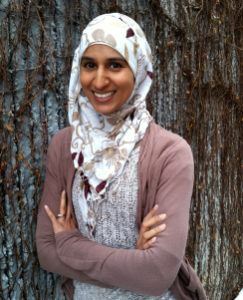 When Nausheena was starting out her efforts with RISE five years ago, she noticed that the Twin Cities were already brimming with over 60 active Muslim organizations. But of those 60, only a handful had women on the leadership board, and even fewer were led by women. Nausheena realized the need to shift this statistic by organizing female leaders for sustainable change. She believes that women’s movements can and should take charge. “It’s important for Muslim women to talk to women leaders who look like them, who share their Muslim identity or a common cultural identity,” says Nausheena. She invites speakers, role models who tell their stories at RISE public events. The speakers are diverse – they are corporate and nonprofit leaders, social entrepreneurs, women who are balancing home life, work life, and religious life. RISE challenges the negative narratives about Muslims by letting Muslim women own the narrative, bringing active Muslim women to the forefront. “The negative narratives harm Muslim women, but they also chip away at gender equity for all women,” Nausheena says. Women do show up. They have been and are engaged, and people need to see them. “Have you heard that the Royal Brunei airlines have an all-women pilot crew? Do you know of Benazir Bhutto? Or Fadumo Dayib, the woman presidential candidate in Somali?” Nausheena asks. They – and many other she-roes – are creating a ripple effect, a revolution, working to combat and overcome discrimination. Fartun and Nausheena spoke about the ways Isuroon and RISE encouraged women voters’ participation in the latest election. Many women underwent training and served as election judges on November 8th. Even more women participated in caucus trainings, where they gained a better understanding of all the different political positions and learned how to write resolutions. Both organizations want women to understand the policies that are affecting them, so that they can be an active voice for the needs of their communities. There is a perception that Muslim women aren’t competent or active enough, or politically active at all. Often it extends to non-Muslim sisters as well, and that’s not true. “Women are already powerful. They are ready to do important things within their communities, they just need somebody to push them into believing it’s possible. I’m here as a connector for them, and I’m also figuring it out with them,” says Nausheena. 2017 will be different for both RISE and Isuroon. The organizations are growing, expanding, creating interfaith and intercultural partnerships — Mary’s Pence is proud to be one of them. Truly, RISE and Isuroon are about growing a network where women create opportunities for other women, care for themselves, and build sisterhood. We asked Nausheena and Fartun to share their thoughts in light of the November 8 election and subsequent turmoil. 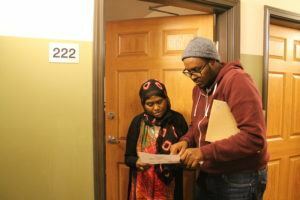 They both call for dialogue and for community involvement in the lives of Minnesotan Muslim women. As communities experience disillusionment that spans across political and social divisions, Fartun offers Isuroon as a space for solidarity and action. Isuroon co-organized Sambusa Sunday last weekend – anyone in the Twin Cities was welcome to join the Somali community at Loring park to have sambusas (traditional Somali baked goods), and have conversations warmed with a cup of tea. Isuroon will continue to promote the message of inclusion and serve as a veritable ER, a crisis line of support. Nausheena talked about reports of abuse as well – people from the Muslim community were contacting her, telling her about bullying incidences in school and harassment on the streets. RISE has immediately mobilized the community. “We asked everybody who came in touch with us – ‘what are you feeling?’ It’s important to not dismiss feelings, to let people know they are not alone, and that others are feeling similarly,” says Nausheena. RISE has rebounded from the initial shock and has already organized quick trainings and conference calls to help people in the community understand their agency to resist hate. We stand in solidarity with Fartun and Nausheena, and all communities that are experiencing fear in this time of uncertainty.